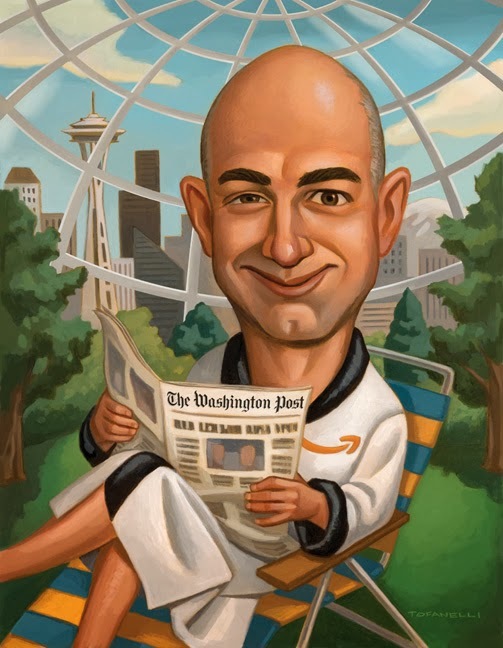 Mike Tofanelli illustrated this full page portrait of Amazon CEO Jeff Bezos for Seattle Magazine's "Most Influential People of 2013" feature. Mike depicts Jeff enjoying his latest acquisition, The Washington Post, while kicking it in his "soon-to-be-built" Amazon biosphere. Tim O’Brien: What’s in a Brand Name? Valeria Petrone: Happy Wild Holidays! Ruth Rowland: Happy Creative New Year! Judith Drews: Oh, La La…! Chris Gash: What Price Love? Ellen Byrne: Will The West Rise Again?